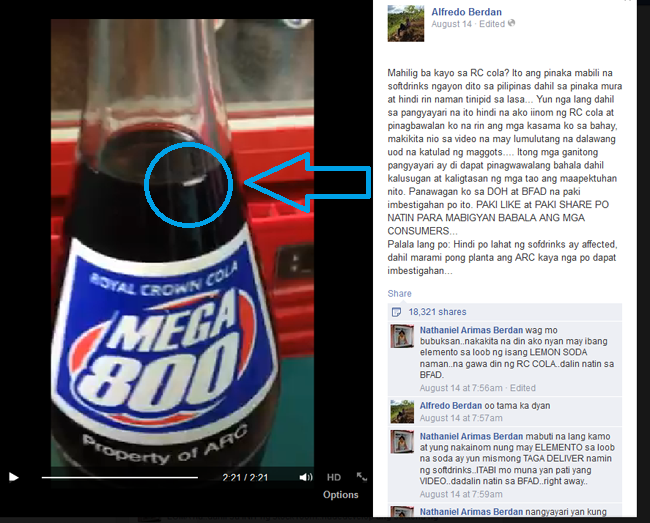 Maggots allegedly found inside an unopened RC Cola soft drinks caught on a video uploaded by a Facebook user named Alfredo Berdan last August 14, 2014 at 7:48 a.m. went viral a few days after. The said video has been shared 18,489 times on Facebook and still counting. The video was uploaded in an attempt to inform everyone about the issue and it seeks for DOH and BFAD’s investigation on a maggot found inside an unopened RC Cola as claimed by Berdan. Some commentators on the video advised Alfredo Berdan not to open the bottle and bring the item to BFAD for inspection to maintain the soft-drink’s integrity. RC Cola is a cola-flavored soda that is also known as Royal Crown Cola and was developed by Claud A. Hatcher in 1905. Hatcher was a pharmacist in Columbus, Georgia, United States according to wikipedia. As we recall, last month, there was a trending issue about the open letter written by certain Gardenia loaf bread consumer who allegedly found an insect on it. The image went viral instantly and got lots of comments from netizens. The bug that was found on the loaf bread was some kind of beetle-like. Wilonah Chan, a businesswoman, was about to take her breakfast and eat a slice of the bread when she found the bug in the bread. This made her decide to write an open letter due to her disappointment. The company immediately investigated the loaf bread and they also changed the bread harboring a bug with a new one. Until this time, there is no update yet about this Maggots Allegedly Found Inside Unopened RC Cola even though the video was already on social media for four days already. We do hope that this incident will be investigated as soon as possible for the safety of the consumers. Bookmark this page for you to be updated on the development of the issue.